Apple honey cake is perfect for fall and can be served at breakfast and dessert (or really any time of the day). For some spice, add a bit of cinnamon to the dough. 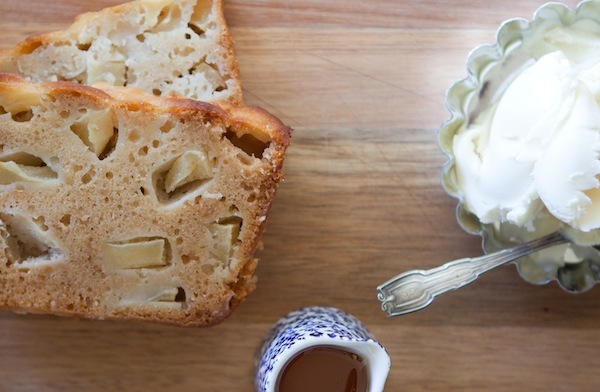 To make the apple honey cake, start by preheating the oven to 350˚F. Thoroughly butter a 9x5x3-inch baking loaf pan and dust lightly with flour. In a bowl, sift flour, baking soda and salt together. In a second bowl, whisk eggs and honey until smooth and evenly incorporated. Then whisk in cider, oil and vanilla. Using a wooden spoon, stir dry ingredients into the wet ingredients until just combined. Do not over mix. Stir apples into the batter. Bake for 40-50 minutes or until wooden skewer inserted into the middle comes out clean. Serve warm with a scoop of your favorite ice cream.